From website Beyond the Ultimate, 2007, quoting Stoudemire: "I grew up in a Christian family, and my father took us to church every Sunday and Wednesday without fail... Going to church helped me develop a relationship with Jesus, and that has given me something to lean on as I have worked to reach my goals." In August 2010, the media reported Stoudemire visited Israel, and photographs were published of a Star of David tattoo on the back of his left hand. 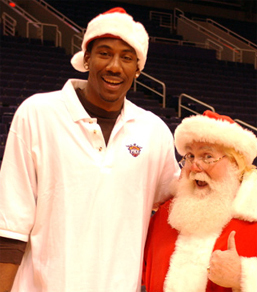 But a quote from Stoudemire's agent, reported by TMZ: "I know there are some reports that he is Jewish, but he is not. He thinks there may be some Jewish blood on his mother's side and he is researching it." But then later, in "Knicks Star Amar'e Stoudemire Keeps Things Kosher", New York Post, 20 August 2010, Stoudemire says that he is a practicing Jew "spiritually and culturally", and admits a kosher diet, though "I'm not a religious person, so it's not from a religious standpoint."